S4BB Limited has just launched an update for ViSS – Video Shrink ‘n Share – on BlackBerry World. ViSS allows to select any video and it then shrinks it to a size that can be shared through various social media. Besides BBM and WhatsApp, this latest release adds support for YouTube, WeChat and Email. From now on, users don’t need to remember the maximum file size of videos they want to share with their friends and family. ViSS stands for Video Shrink and Share. The name says it all! The name says it all! ViSS makes it possible to send any length of video through various social, which have file size limitations. ViSS automatically determines the right compression method to shrink your large video file to a size that can be shared. Supported Social Media: BBM, WhatsApp, WeChat, YouTube, Email. Now you can send a video of any length and any file size to your friends through BBM and WhatsApp. 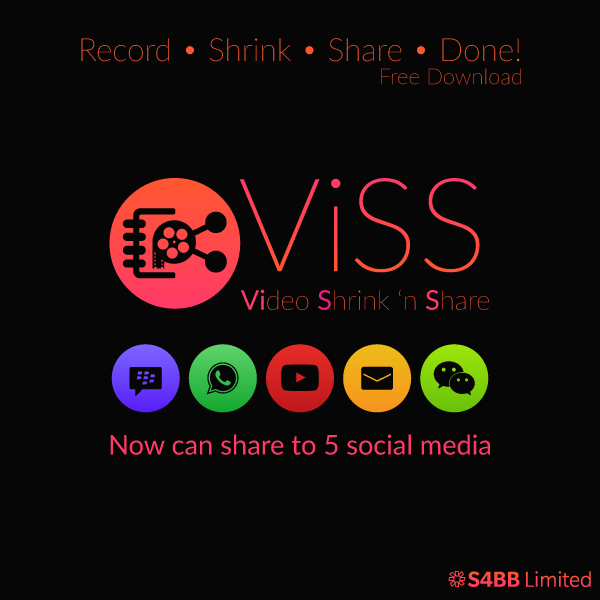 This free trial of ViSS allows you to shrink & share videos up to 30 seconds of length. If you want to shrink and share videos with larger file size, please upgrade to the pro version inside the app. ViSS is compatible with all BlackBerry 10 phones, including the BlackBerry Leap, Classic, Passport, Z3, Z10, Z30, Q5, Q10, P’9982 and P’9983.